In our rapidly developing age of information and technology, expanding globalisation and all-consuming industry, the ability to pause, think and even wonder may be more significant than ever before, writes Xavier College student Ned Kelliher. Although I have yet to study extensively the teachings of Ignatian spirituality and the deep theology imbedded in the Society of Jesus, I have had the honour of experiencing a Jesuit education over the last six years. In this time, I have come to appreciate the core values of St Ignatius and the early Jesuits, particularly their commitment to discernment, spirituality, awareness and service. 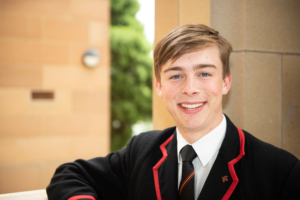 Ned Kelliher is College Captain at Xavier College in Kew, Vic. Eager to share my vision for a world of trust and opportunity, I believe that the Jesuits, and the educational communities they foster, can have a meaningful influence in accompanying our generation in the formation of a hope-filled future. The growing focus on reflective attitudes, and the use of practices like mindfulness in professional industries, highlight the importance of awareness. To be comfortable in our own body, mind and soul is something that many strive for. Through the practice of Ignatian spirituality, I have experienced how beneficial this can be for our personal wellbeing. As a community, if we manage to harness this environment of reflection and self-analysis, it may give momentum to the rise of fundamental values, including trust, openness, hope and opportunity. In our society, it often takes the successful demonstration of a new concept by a professional industry for it to be accepted and recognised in all parts of the community. The continued development of reflective programs in workplaces, religious identities and local community groups will promote inquiry and discussion. This is particularly significant in schools and education facilities, where young minds are blossoming, exploring their own potential and understanding their value. By encouraging an environment like this, with emphasis on awareness, hope, virtue and trust, we lay the foundations for a generation who may strive for and facilitate positive growth in society. At their heart, the Jesuits focus on spirituality, encouraging all to look inward before contemplating the value of our actions. In our rapidly developing age of information and technology, expanding globalisation and all-consuming industry, the ability to pause, think and even wonder may be more significant than ever before. Connectivity, communication and identity are all becoming redefined in our current climate and it would be of little effect to try and halt or deny such changes. In our ‘creation’ or ‘formation’ of a hope-filled world, we must flow with these changes, embracing the opportunities they provide while maintaining our identity as people and as human beings. The Jesuit community holds the responsibility of any faith group or religious belief to foster environments of spirituality and provide accessibility, relatability and guidance. In our case, we embrace the teachings of Jesus, finding the inspiration not only to be conscious of our values, but to act on our inclinations to be of service to those around us. If we can inspire question and thought, answers will surely follow. Ned Kelliher is College Captain at Xavier College in Kew, Vic. He was invited to reflect on the theme Journeying With Youth, which is one of the Universal Apostolic Preferences for the Society of Jesus announced in February.